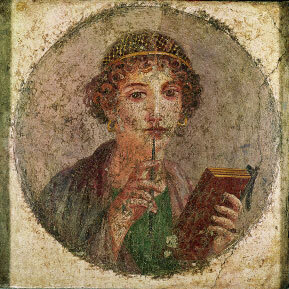 Household Mosaic - This mosaic was set in front of a house in Pompeii, an ancient Roman city. The words at the bottom of the mosaic tell visitors to "beware of dog." Build on What You Know Remember that, in the earliest days of Rome, extended families lived and worked on small farms. Family members knew what was expected of them. During the Roman Empire, family roles became more structured—and so did roles in society. ESSENTIAL QUESTION How were the family and society organized? The head of the Roman family was the father. He owned all the property and had control over other members of the household. The father's power was limited, however, by public opinion and custom. Roman society disapproved of a father punishing his family without good cause. Women in a Roman family enjoyed more freedom than women in Greece. Like women in most parts of the world, Roman women were expected to run the household and take care of the children. But they also could inherit property, and they ran the family business when their husbands were away. Still, Roman women had little power outside the home and could not vote. Emperor's Villa - While most Romans lived in poor conditions, the emperors lived in luxury. A large number of slaves took care of this emperor's villa. Most parents gave their children some education at home. Boys from wealthy families were often sent to private schools, while daughters stayed at home and learned household skills. Girls usually married by age 14, while boys married later. Upper-Class Woman - The young woman in this wall painting wears the clothes and hairstyle of a wealthy Roman citizen. The book and pen she holds are also signs of her class and education. Over time, Roman social classes changed. The old division between patricians and plebeians evolved into upper and lower classes. Patricians and some wealthy plebeians became part of the upper class. A new middle class also developed. Prosperous business leaders and officials belonged to this middle class. Farmers formed one of the lower classes. Slaves made up the lowest—and largest—class in society. Up to one-third of the population were slaves. Some were prisoners of war. Others became slaves because their parents were slaves. Slaves were found throughout Roman society. They worked in low-level clerical positions. However, slaves also performed all jobs requiring physical labor. They worked in mines, on large estates, and as servants. Many suffered cruel treatment. Slave revolts were common, but none of them succeeded. Thousands of slaves died in these revolts. ESSENTIAL QUESTION What religious beliefs did the Romans hold? Religious beliefs bound Roman society together. From the earliest times, the Romans worshiped hundreds of spirits. They believed that these spirits lived in everything around them, including rivers, woods, and fields. Roman families also believed that household gods protected them. They set up shrines in their homes to honor these spirits. Later, Roman beliefs were influenced by other cultures. The Etruscans and Greeks particularly affected Roman religion. The Romans adopted the Etruscan idea of gods in human form. They also adopted Etruscan rituals designed to predict the future. The Romans believed these rituals could reveal whether a specific action, such as a battle, would have a good result. The Romans borrowed many of their gods from the Greeks. 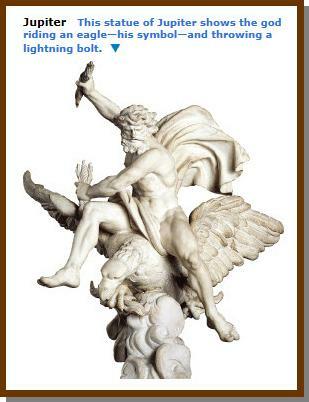 For instance, the Roman god Jupiter, father of the gods, had many of the characteristics of the Greek god Zeus. Apollo, the Greek god of music and poetry, became a key Roman god of the same name. The chart below lists some of the gods that Rome borrowed from Greece. As in ancient Egypt, religion and government were linked in Rome. Priests were government officials, and the emperor was the head of the church. Roman gods were also symbols of the state. Romans were expected to honor these gods in public ceremonies. Over time, even the emperor himself became a god. At first, the Romans only worshiped emperors after death. But eventually they honored living rulers as gods. Loyalty to the emperor became the same as loyalty to the gods. ESSENTIAL QUESTION What was life like in Roman cities? At the height of the Roman Empire, the city of Rome had nearly 1 million people. Other Roman cities, such as Alexandria in Egypt, were also large. However, Rome was the center of the empire. People from all over the empire moved to Rome. This mix of people produced a lively blend of ideas and customs. The number of people also created some problems. Rome's city center was crowded, dirty, and noisy. Much of the city's population was unemployed and poor. These people lived in large, rundown apartment buildings. They had small rooms with no running water or toilets. They often dropped their trash out the windows, sometimes injuring people walking in the streets below. Fire was also a constant danger. These problems were common in other Roman cities as well. Poor Romans also had little to eat. Typical foods were bread, olives, and fruit. But the government provided free grain to keep people happy and avoid public unrest. Archaeologists have discovered that the typical Roman public bath was built on a foundation of pillars. Roman architects constructed a furnace that opened into the area beneath the bath. When slaves burned wood in the furnace, hot air flowed around the pillars. This hot air heated the rooms and water above. By contrast, wealthy Romans enjoyed a life of luxury. They lived in large, comfortable homes in the countryside. They spent their time going to the theater and enjoying themselves. They also held fancy dinner parties. These meals featured fine foods like dates, oysters, and ham. They also included unusual dishes like salted jellyfish, roast parrot, and boiled flamingo tongue. The Romans came up with a number of practical solutions to some of their urban problems. They built sewer and plumbing systems to improve sanitation. They also built aqueducts (AK•wih•DUHKTS) to carry fresh water from springs, streams, and lakes into towns. The water traveled through a system of channels and pipes. Most of these were underground. However, some were supported on high arched bridges. Many of these aqueduct bridges survive and are still used today. Public baths were another important part of city life. Most towns and even most Roman forts had public bathhouses. Romans of all classes visited the baths to bathe and socialize. Aqueduct - a pipe or channel that carries water from a distant source to a city. To distract Romans from the problems of city life, the government provided entertainment at large public arenas. One of these was the Circus Maximus (MAK•suh•muhs), a large oval stadium used for chariot races. Another famous arena was the Colosseum. There, Romans could watch gladiators, or trained warriors, fight to the death. The spectacles they watched combined bravery and violence, honor and cruelty. Family life and social classes were important in ancient Rome. Romans worshiped many gods both privately at home and in public ceremonies. Roman city life was challenging, but the government tried to ease some of its problems. Why It Matters Now . . . Ancient Rome was a mixture of different cultures and beliefs, just like many modern societies.